China’s domestic battery-grade lithium-carbonate spot price remained stable this week, while the transportation of lithium compounds stopped ahead of the Lunar New Year holiday (February 4-10). Battery-grade lithium carbonate prices stable ahead of the holiday. Lithium hydroxide prices unchanged on thin trading activity. Seaborne Asian cif China, Japan & Korean prices remain unchanged. Spodumene prices assessed stable month on month. Warren Buffett's Berkshire Hathaway Inc has signed an agreement to allow extraction of lithium from its geothermal wells in California, a project that could offer U.S. carmakers and battery producers a secure supply of the metal, the Financial Times reported on Sunday. But CCHENâ€™s discovery that its records of lithium exports are far from accurate could complicate the agencyâ€™s efforts to determine just how much lithium SQM and Albemarle have mined and when their quotas of the metal will be exhausted. Albemarle and SQMâ€™s Chilean operations are critical to the global supply of lithium. Together, their Chile plants produced nearly 40 percent of the worldâ€™s lithium in 2017. Nuclear agency CCHEN has authorized lithium quotas and exports since 1979, when the military government of ex-dictator Augusto Pinochet declared lithium â€œstrategicâ€ because of its nuclear applications. Germany and Bolivia today sealed a partnership for the industrial use of lithium , a key component in the batteries that power electric cars and cell phones. "Lower Chinese prices are being used by consumers to obtain lower prices for next year," a lithium producer told Fastmarkets IM. "It is undoubtable that Chinese prices affect the rest of the world pricesÃ¢â‚¬Â¦ we will [therefore] start next year with softer prices than the ones achieved in 2018." Source: Fastmarkets But contract prices have softened recently, falling month on month throughout the fourth quarter of 2018. This highlights ChinaÃ¢â‚¬â„¢s influence on prices elsewhere and especially in contracts signed with companies that have direct relationships with Chinese battery makers. Bernstein has forecast an even lower lithium price after this yearÃ¢â‚¬â„¢s falls. Since the start of 2018, the price for various forms of lithium has fallen steeply as supply comes online and structural changes to the Chinese market squeezed prices all the way to the finished lithium-ion batteries. Bernstein analyst Paul Gait said in a note lithium producers' margins were far too high for a sustainable supply chain. "Despite the price fall Ã¢â‚¬Â¦ lithium prices still imply astonishingly high returns on any investment in lithium production capacity," he said. "Current lithium carbonate prices are in the range of US$10,000-15,000 per tonne depending on the exact price series one selects to look at, but according to our analysis, these prices would still imply IRRs of between 46% and 74% based on our representative list of 20 lithium projects from around the world." This is well down on his Ã¢â‚¬Ëœfair' price from last year of $12,900/t..
Australia must not squander the Ã¢â‚¬Å“once-in-a-generationÃ¢â‚¬Â opportunity presented by the booming demand for lithium-ion batteries and should build a dedicated manufacturing sector instead of sending the nationÃ¢â‚¬â„¢s vast amounts of locally mined lithium offshore, federal government ministers have said. The Morrison government on Tuesday released an Austrade report on lithium Ã¢â‚¬â€œ a key ingredient in lithium-ion batteries, which are used in electric vehicles, electronic devices like mobile phones and laptop computers, and to store renewable energy. 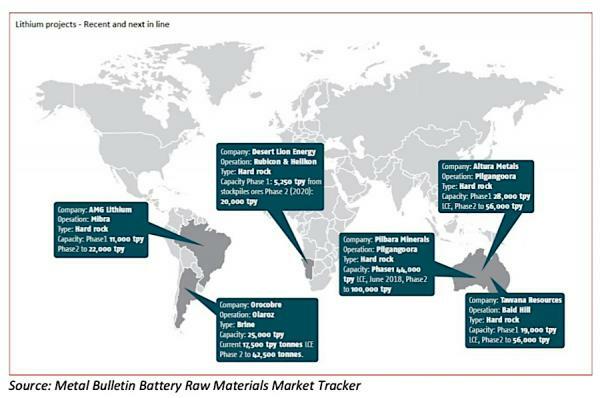 Australia is well-positioned to capitalise on the Ã¢â‚¬Å“lithium-ion battery eraÃ¢â‚¬Â, the report said. Australia has the third-largest reserves of lithium in the world and is the largest producer of hard-rock lithium spodumene.